When your workspace calls for a keyboard tray with all of your accessories on one handy surface, design the perfect one for you with the Humanscale 550 Big Compact Keyboard Tray. Humanscale keyboard trays are designed to ensure that users are able to work consistently within their Neutral Reach Zone, reducing negative health effects from straining or overreaching. Keep your keyboard, mouse, and everything you need at your fingertips with one desk accessory. Tilt and type in the negative for even more comfort at the keys than you ever thought was possible. The Humanscale 550 Big Compact Keyboard Tray is now available with a Design Your Own option, so you choose the right keyboard tray components that elevate your work style in the direction of better ergonomics. The Humanscale 550 Big Compact Keyboard Tray is available in black, white, or platinum. Both the keyboard mechanism and platform will come in the chosen color. A separate mouse platform is not available with the Humanscale 550 Big Compact Keyboard Tray as this keyboard tray is large enough to support mousing on the main platform. 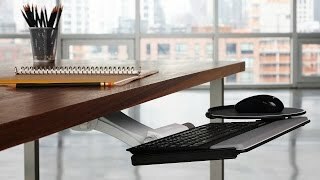 For the Humanscale 550 Big Compact Keyboard Tray, you can select a solid 25" palm rest or a split palm rest with one 20" section and one 5" long section; this feature comes in handy if a user doesn't want a palm rest in front of their mouse or keypad (pictured in main image above). All are covered with an easy to clean, black synthetic leather. For users with "slim" keyboards such as those made by Apple, a 19'' "slim" gel palm rest is available. Please note that this palm rest will not reach across the entire length of the tray, and will not fit flush against the keyboard tray corners like the 20'', and 25"' palm rests. The slim 19'' palm rests will sit roughly 5/8'' away from the closest corner when installed. When designing your Humanscale 550 Big Compact Keyboard Tray, if you choose to not add a palm support, there will be holes located at the installation points on the tray. A mouse pad for the separate mouse platform is not available with the Humanscale 550 Big Compact Keyboard Tray as this keyboard tray is large enough to support mousing on the main platform. It gets the job done, but a few complaints. This keyboard tray is a great size, fits both my keyboard, my rollerbar mouse and my regular mouse. The tray is very thin, 1/2 a centimeter thick. I wish it had a locking feature to lock it at a specific height because when I hit it with my knee, it moves up and I have to readjust it again. It is very slow moving in and out from under my desk, have to push pretty hard to get in under the desk all the way.